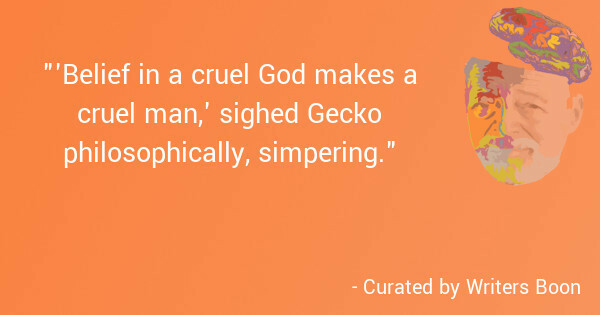 This is a quote from a gangster called Gecko. A preacher called "Preacher Moon" is sent to a town called Jacksonville, which rife with prostitution, hedonistic partying and drug taking. At the center of this "depravity" is Gecko, a gangster. Once he has found him Preacher Moon confronts Gecko, who he deems will be an easy foe. Gecko proves to be wise and clever and can easily outsmart the pious preacher. The gangster offers the preacher some cake, which is laced with opium. The preacher goes into a trance and has visions, including the beautiful naked vision of the gangster's daughter. Finally when the preacher returns to reality, he finds himself tied to a horse and he leaves the town at speed, his mission incomplete.